Sam has over fifteen (15) years’ experience in Debt & Equity Capital Markets, Mergers & Acquisitions and Financial Advisory Services. 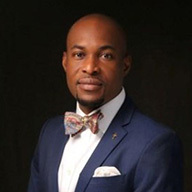 He began his Investment Banking career at NAL Bank Plc, now Sterling Bank Plc, from where he moved to UBA Global Markets, which later became UBA Capital. He then joined Dunn Loren Merrifield as Head of Corporate Finance before moving to Planet Capital. He holds a BSc. Degree in Business Management from UNEC, an MBA from the University of Lagos. He has attended executive courses at Lagos Business School – Chief Executive Program and IESE Business School, Barcelona Spain – AMP.